VAIO has returned to Hong Kong, Taiwan, Singapore and Malaysia. 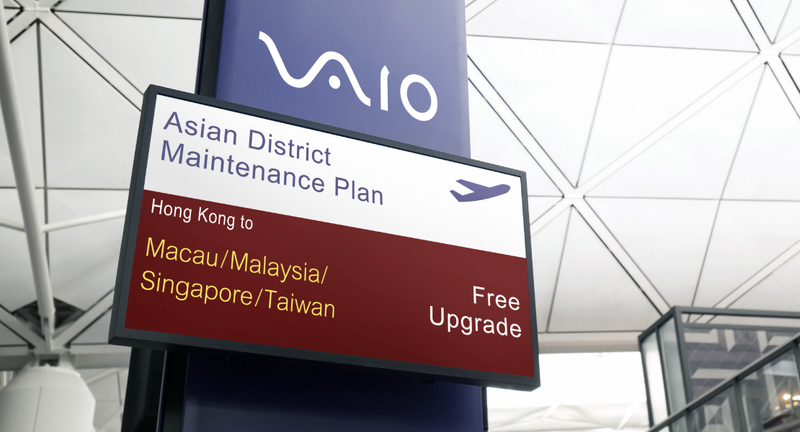 In the pursuit of perfection in craftsmanship and total quality, we sincerely launch the "Asian District Maintenance Plan" to provide more comprehensive service for VAIO customers. Upon purchase of VAIO S11 or S13 from authorized dealers from Hong Kong, Macau, Taiwan, Singapore or Malaysia, customers can enjoy warranty services among regions (Hong Kong, Macau, Taiwan, Singapore and Malaysia). (Current customers of VAIO S11 and S13 are entitled to this plan).